Take a look at some fun analysis based on demographic data and using a demography library in R to get the proportion of people alive in 1945 who are still alive today. In demography, we like to use life tables to estimate the probability that someone born in 1945 (as an example) is still alive nowadays. But another interesting quantity might be the probability that someone alive in 1945 is still alive nowadays. The main difference is that we do not know when that person, alive in 1945, was born. Someone who was old in 1945 is very unlikely to still be alive in 2017. To compute those probabilities, we can use datasets from here. More precisely, we need both death and birth data. I assume that datasets (text files) were downloaded (it is necessary to register, for free, to get the data). 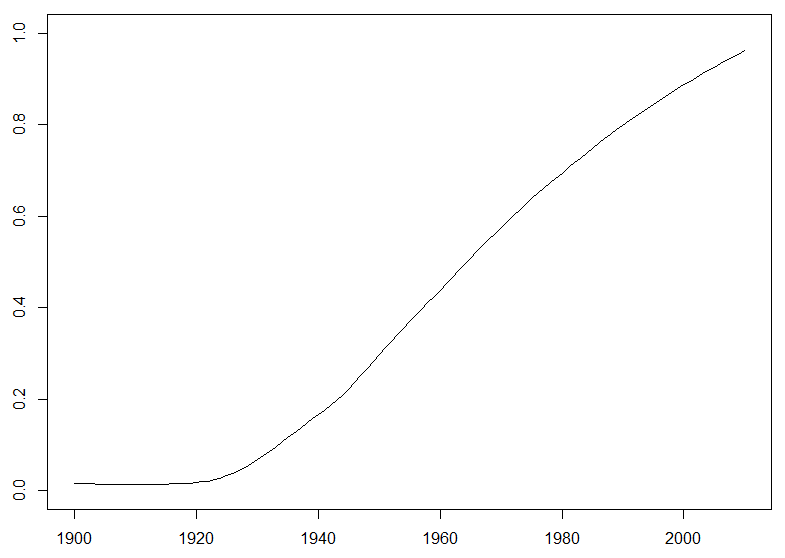 The number of people (here, let's consider women only) born in 1930 (from the birth database). The number of death of people of age 0 in 1930, people of age 1 in 1931, people of age 2 in 1932, etc. We have a single number for the number of births, and then a vector for the number of deaths. Consider now another function. Consider the people born in 1930. We want to get two numbers: the number of people still alive in 1945 (say), and the number of people still alive nowadays. The ratio will be the proportion of people born in 1930 that were alive in 1945 that are still alive in 2015. 63.7% of those alive in 1975 are still alive 40 years after. That is a rather interesting function; I was surprised that I couldn’t find it is standard demographical R package.